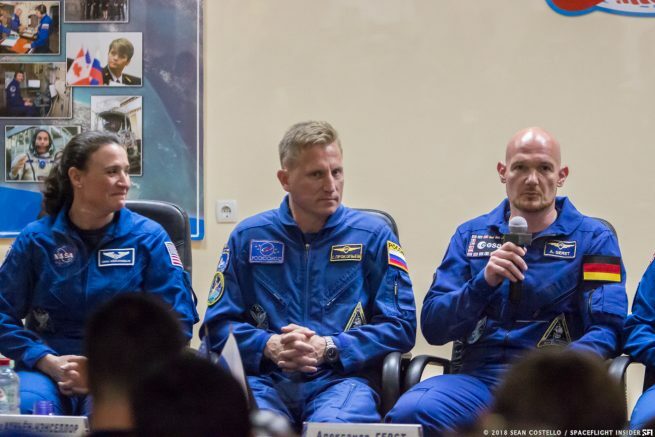 Flying to space to be part of the space station’s in-progress Expedition 56 is Russian cosmonaut Sergey Prokopyev, NASA astronaut Serena Aunon-Chancellor and European Space Agency astronaut Alexander Gerst. They are expected to rendezvous and dock with the ISS Friday morning after some 34 orbits of Earth. Serving as the Soyuz MS-09 commander is 43-year-old Prokopyev. Selected to be a cosmonaut in 2010, this is be his first flight into space. Before that, he served as a commander in the Russian Air Force. 42-year-old Gerst is on his second spaceflight. The German astronaut’s first flight was in 2014 as part of the Expedition 40/41 increment. During that stay, he performed a single spacewalk with NASA astronaut Reid Wiseman to replace a failed cooling pump. Also on her first spaceflight is Aunon-Chancellor. The 42-year-old was selected to be a NASA astronaut in 2009. Previously, she worked as a flight surgeon for the U.S. space agency and served as the deputy crew surgeon for STS-127 and Expedition 22 in 2009. Once the trio arrives at the outpost, it will be a very busy period for the space station. Indeed after the June 14 spacewalk, which will be performed by already-aboard NASA astronauts Drew Feustel and Ricky Arnold, SpaceX’s CRS-15 Dragon capsule is slated to launch June 29 and arrive July 1. Next will be the unberthing of the Cygnus cargo spacecraft in mid-July. Finally, in mid-August the Japanese Kounotori-7 spacecraft is slated to fly to the ISS. Additionally, the crew is set to conduct more than 250 science investigations in areas such as biology, Earth science, human research, physical sciences and technology development during the Expedition 56 increment, according to NASA. Among the many people witnessing the launch was ESA Director General Johann-Dietrich Worner. Worner said many ESA experiments on the ISS are mainly financed by industry a public-private partnership, adding that microgravity experiments will still be needed even after the end of the ISS. Moreover, he said ESA is also looking ahead at the possibility of what to do beyond low-Earth orbit. The crew began launch day by waking up at the Cosmonaut Hotel some nine hours before their planned liftoff. Three hours later, the trio departed for Site 254 to begin suiting up in their Sokol launch and entry suits. Meanwhile, fueling of the 162-foot (49.5-meter) tall Soyuz-FG carrier rocket (which rolled to the launch pad two days earlier) with kerosene and liquid oxygen started at about 2:12 a.m. EDT (06:12 GMT) and continued for about two hours. At 4:12 a.m. EDT (08:12 GMT), the crew finished suiting up before boarding a bus to head to the launch site, Pad 1/5. Known as Gagarin’s Start, this is the same pad that was used to send Yuri Gagarin into orbit in April 1961 to become the first human in space. Once at the pad some 20 minutes later, they walked up stairs to board a small elevator on one of the clamshell gantry towers. They paused for a few minutes to wave goodbye. After being strapped into the descent module of the spacecraft, the hatch was closed and leak checks began. This occurred around one hour, 20 minutes before launch. Then, after that was completed, the pad service structures and clamshell gantry service towers were retracted. The crew began checking their Sokol suits for leaks some 37 minutes before launch and completed that process about 15 minutes before leaving Earth. All of the pre-launch operations were completed about seven minutes before launch. Propellant tanks were pressurized around two minutes, 45 seconds with the vehicle transferring to internal power at one minute to liftoff. At 35 seconds to launch, the first of two umbilical towers separated. The final umbilical tower separated separated at 15 seconds to liftoff. Twelve seconds before leaving Earth, the launch command was issued and the four RD-107A booster engines and single RD-108A core stage engine at the base of the rocket ignited and began to spool to full power. The engines reached maximum thrust five seconds before lifting off the pad. At zero, the vehicle began rising skyward, pitching over toward the space station’s orbital inclination of 51.6 degrees. After nearly two minutes of flight, the launch abort tower, which was no longer needed, jettisoned. 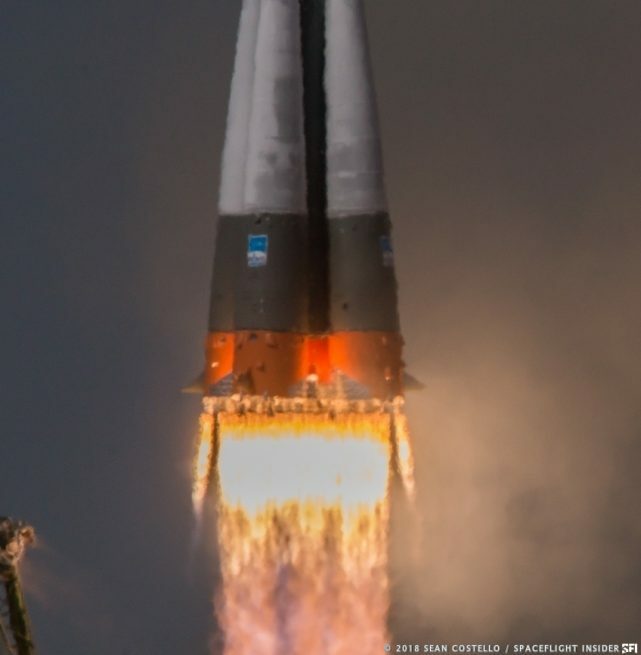 Several seconds later, the four strap-on boosters separated and fell away in an iconic pattern known as the Korolev Cross, which was named after the designer of the rocket Sergei Korolev. Two minutes 40 seconds after leaving Kazakhstan, the clamshell payload fairing separated and fell away as it too was no longer needed. At this point, the crew inside was able to look out of the window to see Earth’s atmosphere fade to black as they began to fly above it. About four minutes, 45 seconds into the flight, the core stage finished firing and separated. But seconds before that occurred, the upper stage—called the third stage—fired its single RD-0110 engine in a process called hot staging. This is why the interstage has an open metal lattice design to allow the exhaust to leave as the engine is spooling up. Once the third stage was in control, it continued firing until about eight minutes, 50 seconds into the flight. A moment later, the Soyuz MS-09 spacecraft separated and deployed its antennas and solar panels. Over the next two days, Soyuz MS-09 will gradually raise its orbit and begin the process of catching up with the space station. In about 34 orbits, the spacecraft will be within sight of the outpost and begin the process of lining the vehicle up for an autonomous docking with the Rassvet module on the Russian Orbital Segment of the ISS. Docking is currently anticipated for 9:07 a.m. EDT (13:07 GMT) June 8. The hatches between the two vehicles will occur about 1.5 or two hours later. Once inside the ISS, Prokopyev, Anon-Chancellor and Gerst will join the trio that is already aboard—Russian cosmonaut Oleg Artemyev, as well as NASA’s Arnold and Feustel. After several hugs and congratulations inside the cramped Rassvet module, the six will head to the Zvezda service module for a traditional conference with friends and family via Russian mission control in Moscow. The launch comes less than a week after another trio left the ISS in Soyuz MS-07. 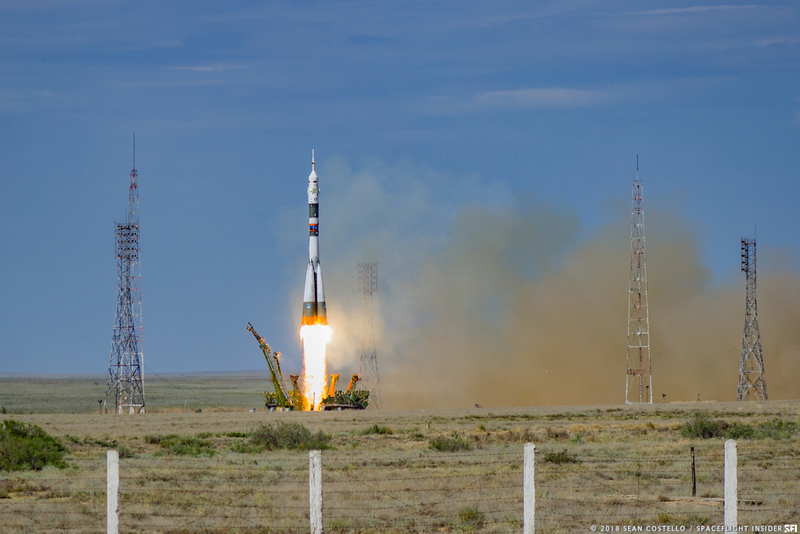 Russian cosmonaut Anton Shkaplerov, NASA astronaut Scott Tingle and Japan Aerospace Exploration Agency astronaut Norishige Kanai landed on the Kazakh Steppe several hundred miles northeast of Baikonur. Prokopyev, Aunon-Chancellor and Gerst are expected to remain aboard the ISS until December 2018. Artemyev, Arnold and Feustel are slated to return to Earth in early October. 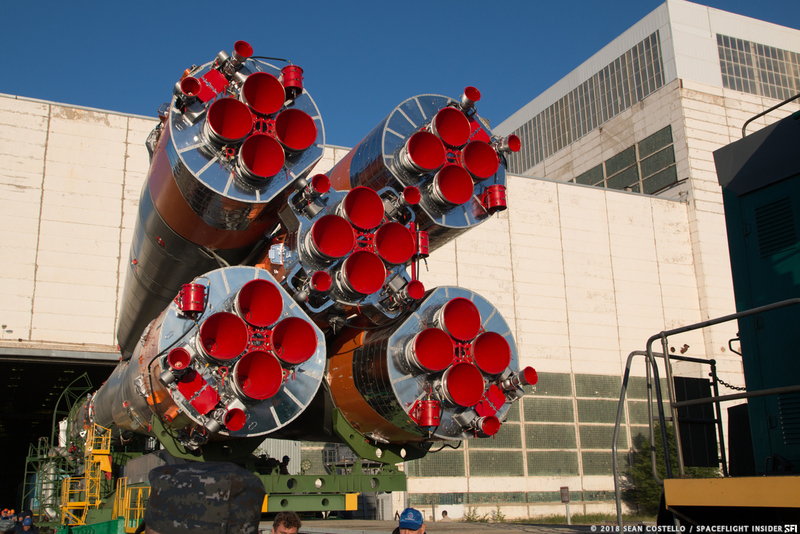 Sean Costello, who was at Baikonur Cosmodrome for the launch, contributed to this story.